Aim of the review The aim of this work was first to define which antineoplastic agents with sufficiently long stability could be eligible in the circuit of home-based therapy (centralised preparation, transport to the patient’s home and administration by nurses) and, second, to propose a standardisation of the stability data of anticancer drugs in use for home hospitalisation. Method A survey carried out in six hospital pharmacies of the Assistance Publique—Hôpitaux de Paris (AP-HP) hospitals, with important activity in oncology, listed the stability data used locally by each site. The final goal is to reach a consensus for the stability of cytotoxic drugs, which was the result of an original collaboration between the pharmacists of the compounding unit and the quality control unit. These results were compared to marketing authorisation data. Results The survey showed that eight antineoplastic agents of 34 were prepared under identical conditions (infusion diluent, concentration range, protection from light, temperature) by all hospitals (3 ≤ n ≤ 6): the stability was identical between each site for only two cytotoxic drug preparations (fotemustine and gemcitabine) and varied by up to 168 h or 7 days for the preparations of dacarbazine, epirubicine and cisplatin. Stability validated by pharmacists and those provided by marketing authorisation ranged respectively from “extemporaneously prepared” at 1,344 h (median = 168 h) to “extemporaneously prepared” at 720 h (median = 4 h). For 11 antineoplastic drugs, no information about the stability after compounding was specified in the marketing authorisation. Of all cytotoxic drugs used in the Hospital at Home of AP-HP, stability after compounding validated by pharmacists was less than 30 h for six of them, between 30 and 78 h for four and exceeding 78 h for the remaining 24. Conclusion Considering the lack of data about cytotoxic drugs stability provided by the pharmaceutical companies and the difficulties in retrieving and interpreting the literature data, a consensus on the stability of cytotoxic drug preparations is essential for the current practice. With this approach, initiated for home hospitalisation, we propose in this study an initiative of the standardisation of stability data which offers a decision support for other centres. We would like to acknowledge the working group of hospital pharmacists for their involvement in this work: Louis Joyeux (Hospital at Home, AP-HP, Paris), Nathalie Leguyader (Armand Trousseau, AP-HP, Paris), Isabelle Madelaine-Chambrin (Saint Louis, AP-HP, Paris), Nicole Poisson (AGEPS, AP-HP, Paris), Delphine Pozzi (Raymond Poincaré, AP-HP, Garches), Patrice Prognon (HEGP, AP-HP, Paris), Marie Savet (Robert Debré, AP-HP, Paris). The authors declare no conflicts of interest directly relevant to the content of this manuscript. Working group of “Pharmacists in Charge of Handling of Hazardous Drugs”: Frédéric Benizri (Department of Pharmacy, Hospital at Home, AP-HP, Paris, France), Brigitte Bonan (Coordinator, Department of Pharmacy, Georges Pompidou European Hospital, AP-HP, Paris, France), Anne-Laure Ferrio (Department of Pharmacy, Georges Pompidou European Hospital, AP-HP, Paris, France), Marie Laure Brandely (Department of Pharmacy, Hôtel-Dieu, AP-HP, Paris, France), Vincent Castagné (Department of Pharmacy, Paul Brousse Hospital, AP-HP, Paris, France), Nathalie Théou-Anton (Department of Pharmacy, Beaujon Hospital, AP-HP, Paris, France), Muriel Verlinde-Carvalho (Department of Pharmacy, Henri Mondor Hospital, AP-HP, Paris, France), Nathalie Leguyader (Department of Pharmacy, Armand Trousseau Hospital, AP-HP, Paris, France). Working group “Analytical Quality Control”: Patrice Bellenger (Department of Pharmacy, Saint Louis Hospital, AP-HP, Paris, France), Makrem Ben Reguiga (Department of Pharmacy, Beaujon Hospital, AP-HP, Paris, France), Marie-Catherine Desroches (Department of Pharmacy, Antoine Béclère Hospital, AP-HP, Paris, France), Christine Fernandez (Department of Pharmacy, Pitié-Salpétrière Hospital, AP-HP, Paris, France), Laurent Havard (Coordinator, Department of Pharmacy, Georges Pompidou European Hospital, AP-HP, Paris, France), Guénola Jabaud (Department of Pharmacy, Albert Chenevier Hospital, AP-HP, Paris, France) Anne-Christine Joly (Department of Pharmacy, Saint Antoine Hospital, AP-HP, Paris, France), Anne Leneveu (AGEPS, AP-HP, Paris, France), Muriel Paul (Department of Pharmacy, Henri Mondor Hospital, AP-HP, Paris, France). The French National Cancer Institute. Plan cancer 2003–2007. Mission interministérielle pour la lutte contre le cancer. Available online at: https://www.e-cancer.fr/v1/fichiers/public/3_brochure_plan_cancer.pdf. Circulaire interministérielle DHOS/SDO/2005/101 du 22 février 2005 relative à l’organisation des soins en cancérologie NOR: SANH0530076C. Available online at: http://www.sante.gouv.fr/htm/dossiers/cancer/circ101.pdf. Haute Autorité de Santé. Practice guidelines: patient selection criteria for at-home cancer chemotherapy—formal consensus. September 2003. Available online at: http://www.has-sante.fr/portail/upload/docs/application/pdf/at_home_chemotherapy_guidelines_2006_11_20__12_27_55_544.pdf. American Society of Health-System Pharmacy. ASHP guidelines on handling hazardous drugs. Am J Health Syst Pharm. 2006;(63):1172–91. 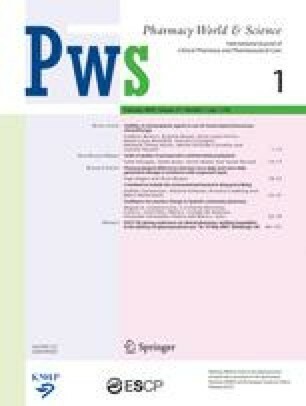 Available online at: http://www.ajhp.org/cgi/content/full/63/12/1172. Agence Française de Sécurité Sanitaire des Produits de Santé. Bonnes pratiques de préparation. 3 Décembre 2007. Available online at: http://afssaps.sante.fr/pdf/5/bonne-pratique-preparation.pdf. National Institute for Occupational Safety and Health. Preventing occupational exposures to antineoplastic and other hazardous drugs in health care settings. NIOSH Publication September 2004;165. Available online at: http://www.cdc.gov/niosh/docs/2004-165/.